The view from Peregrin, on the top floor of the Perry Lane. 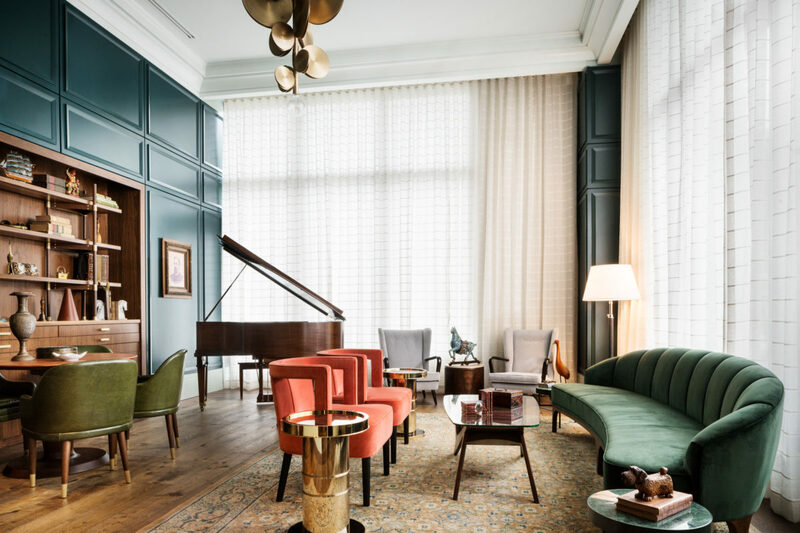 There are certain places—show-stopping hotels, award-winning restaurants, or local dive bars, incomparable vintage shops—that are worth planning your whole trip around. 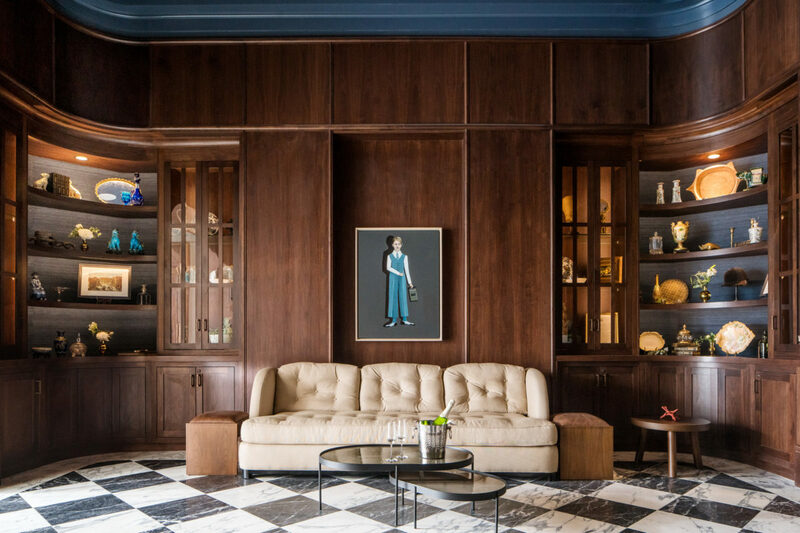 The Perry Lane Hotel in Savannah, Georgia, is one of those places. I arrive in Savannah on an unseasonably humid Friday in mid-November. I am plane-gross and sweaty, still dressed for mid-November in Brooklyn. 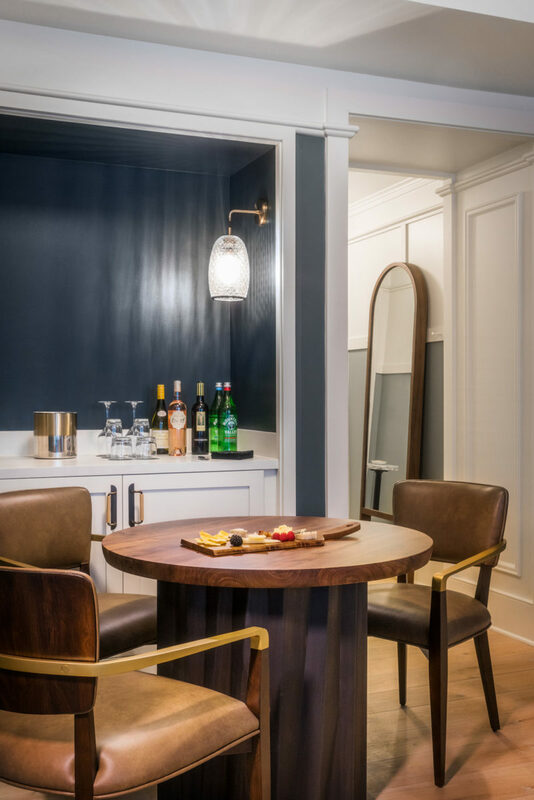 When I sit down at the check-in desk at Perry Lane Hotel, of the Luxury Collection, I instinctively turn down the champagne I’m offered; the idea of getting my luggage up to my room while also managing a full champagne flute fills me with dread. But as soon as I have my room key in hand, a smiley bellboy named Kelly appears to deliver me and my luggage directly to my door. My room is on the fourth floor, it has 180 degrees of windows, and it is, without a doubt, luxe. I quietly mourn my lack of champagne. Everywhere the walls are a lovely slate blue. The furniture is marble-topped, gold-fixtured, and/or upholstered in rose-colored velvet. 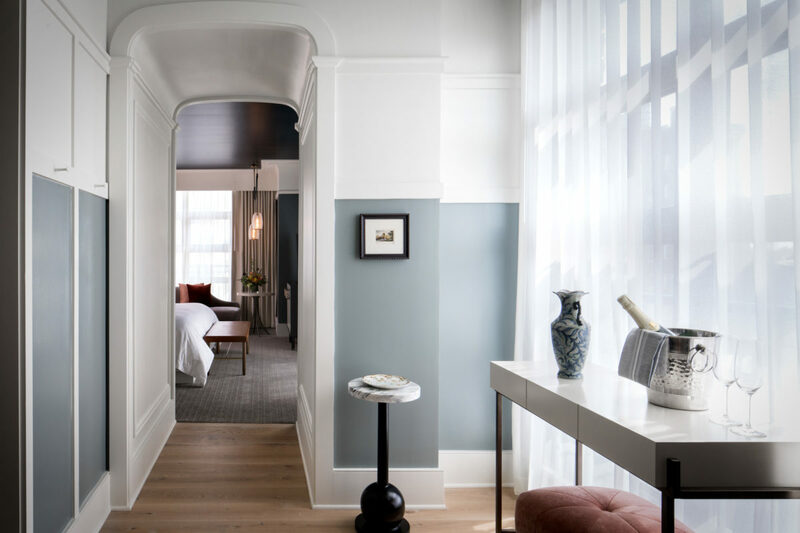 The really knee-weakening feature is an archway that connects the foyer to the bedroom. Most hotels have a certain utilitarian look to them by necessity; this arch is so blatantly anti-utilitarian that I fall in love with it immediately. This arch is all about style. It strikes me as very Southern. In the bathroom, the walls darken to navy. The vanity is topped with black marble. There are two sinks. Since moving to New York, things that are normal to most Americans have become novel to me, like bathrooms with more than one sink. 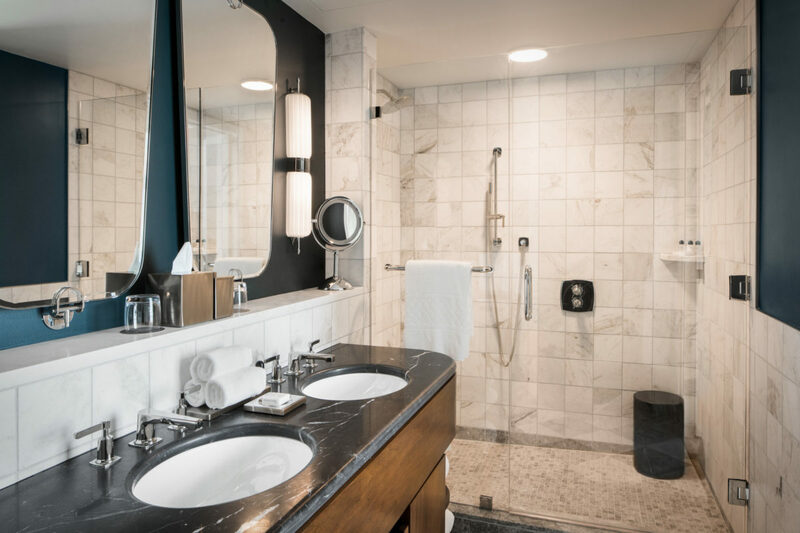 Not only does this bathroom have two sinks, it has two mirrors and a spacious shower stocked with Byredo bath products in proprietary scents. I make a mental note to take them all home with me. I use both sinks with relish. I unpack and decide that the room is mid-century modern, definitely, but with more romance. It’s mid-century modern in love—and so am I. 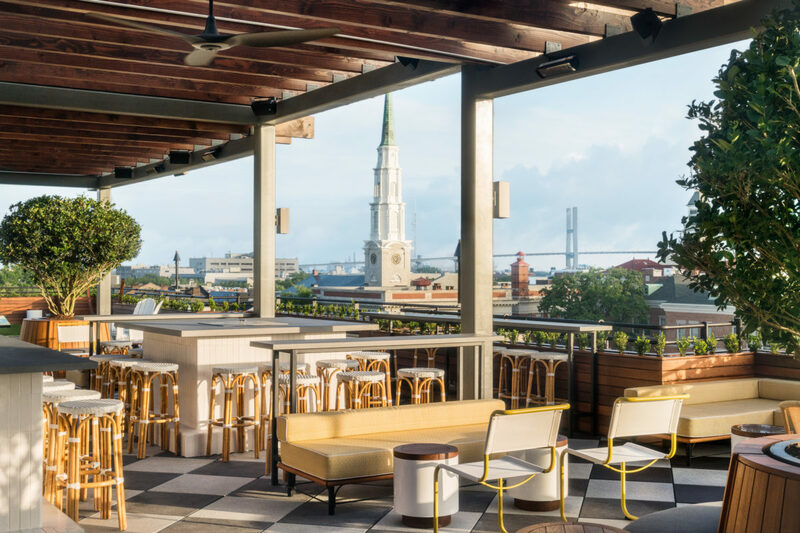 In Savannah, Georgia, The Perry Lane Hotel brings out the best of the southern coastal city. Read more. 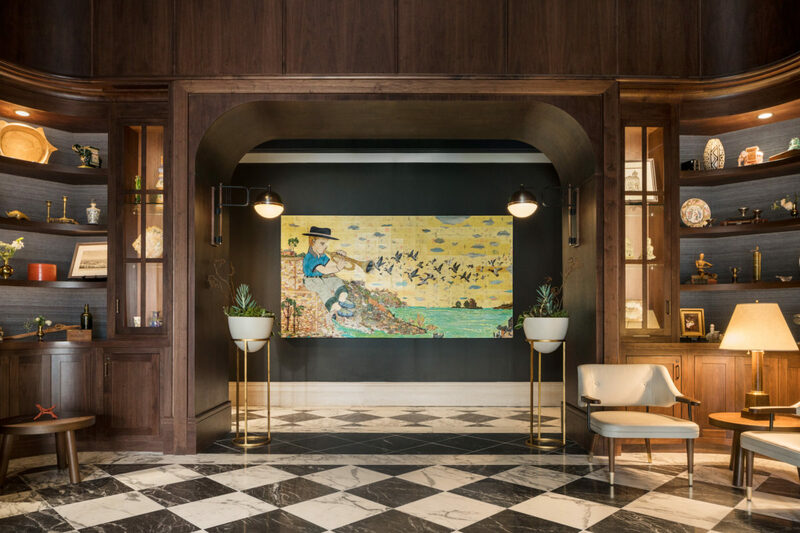 A section of the lobby in the second of the two buildings features a painting by Savannah-based artist Marcus Kenney. 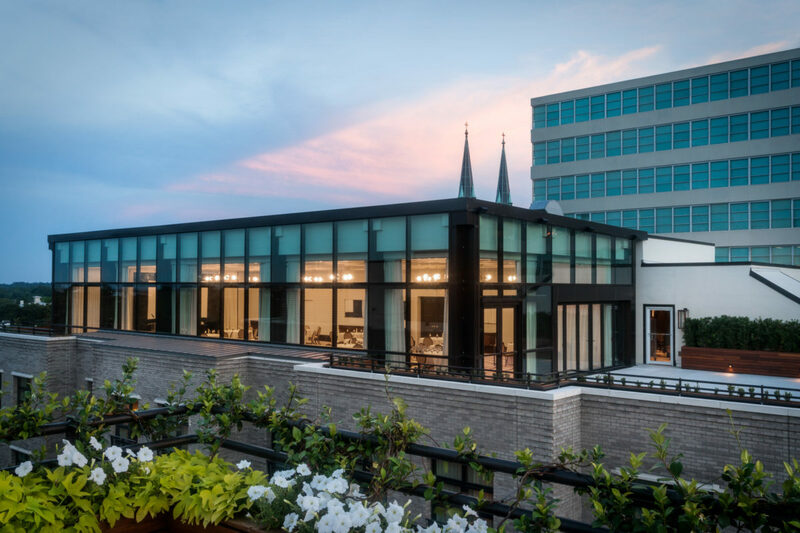 The Perry Lane roof top and outdoor meeting space. The hotel’s dining options are some of the main draws. 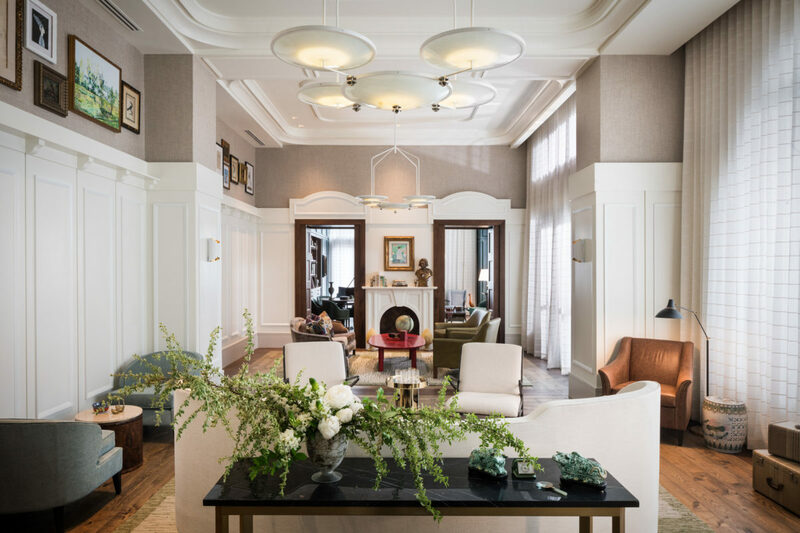 Eat dinner in the top-floor ballroom, order breakfast and lunch to your room from the ground-floor restaurant, the Emporium Kitchen & Wine Market, and drop by Peregrin and The Wayward, the hotel’s two bars. Peregrin is on the roof, with gorgeous checkerboard flooring and 360-degree skyline view. In addition to the spacious bar and wicker-based lounges, it has a section of turf complete with lawn games and a pool. The Wayward is racing-themed (Savannah has a rich history of car racing and motocross) and decked out in leather, definitely the sexier of the two. Everywhere you look, there’s evidence of the city. There’s a lending library in the lobby that was co-curated by the owners of beloved downtown bookstores E. Shaver and The Book Lady. Emporium stocks local wine, beer, and food products like pickles and coffee, and routinely opens its kitchen for cooking classes. And across the lane, Andie Kully boutique carries upscale Savannah brands like Sapelo skin care alongside an array of home goods and resortwear. The hotel goes the extra mile in its entertainment offerings. Guests of Perry Lane can go on architectural tours with an expert from Savannah College of Art and Design, take studio classes with a number of the artists featured in hotel’s collection, tour the workspaces of a baker and a luthier, see live jazz, taste honey at Savannah Bee Company, and do guided yoga on the roof, all facilitated by the Perry Lane. You think god is in the details. You like old-world glamour. You like to be pampered. You like biscuits, craft cocktails, craft beer, pickled eggs, pickled peaches, fried chicken and waffles, lavender lattes, and/or avocado toast. You’ve got a green thumb. You believe chivalry isn’t dead. A mix of locals and tourists. The Perry Lane suite viewed from a hallway. Living area of the Perry Lane suite. Pack for the pool and the cocktail bar. Southern style is refined casual by day (think linen shirts), and semi-formal by night (or completely formal, if you’re into that). You’re likely to see both Doc Martens and pearls. Don’t forget bug spray, even in fall. Leave room in your suitcase for the stuff you’ll bring back. If most of the sights you’re after are in historic downtown, don’t rent a car. 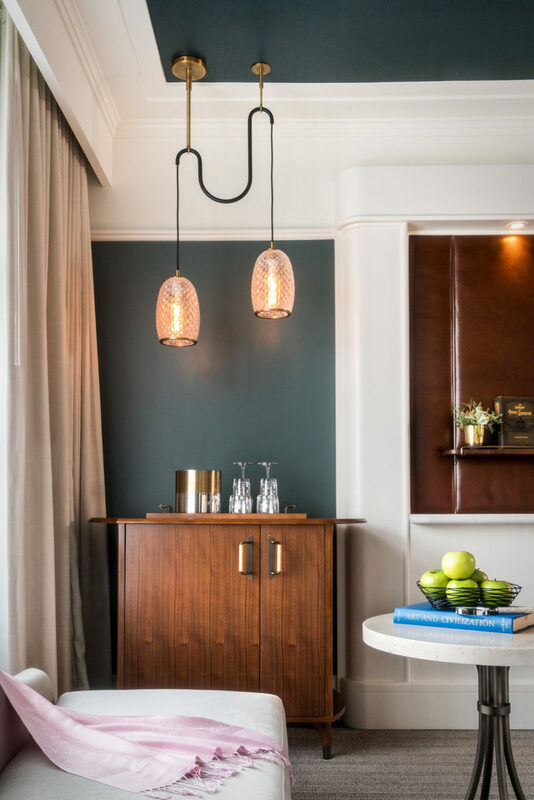 The Perry Lane is located in the heart of the district; many of the city’s loveliest attractions and reputable restaurants are within walking distance. If that’s not quite your speed, the hotel has bicycles available for guest use, or you can hire a horse-drawn carriage or hop on the trolley. Drop into one of the many excellent antique stores, or a contemporary counterpart (Paris Market for home goods, jewelry, gifts; Krewe for sunglasses; E. Shaver for books). Venture out to the Starland District for a look at Savannah’s most vibrant art and music spaces, and stop by Back in the Day Bakery if you go. Visit the Savannah College of Art and Design Museum. 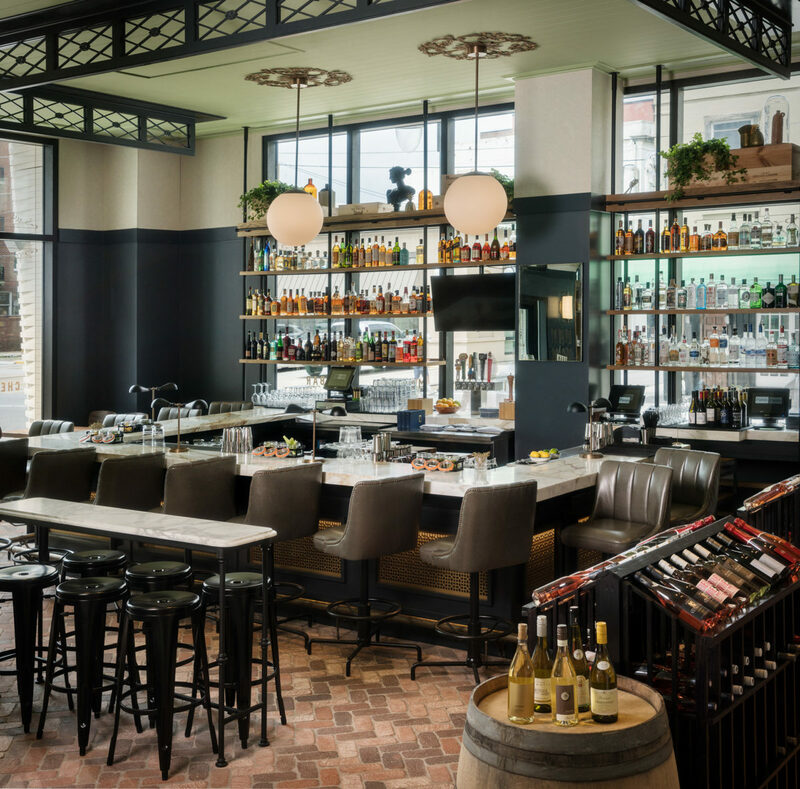 Eat traditional fare at Mrs. Wilkes Dining Room (communal seating). Eat modern fare at The Grey (sit-down dinner), The Grey Market (counter lunch, groceries), Collins Quarter (brunch), The Wyld (seafood, dockside seating), or Fox & Fig Cafe (vegan). Drink at Artillery or The Original Pinkie Masters. Book a ghost tour. 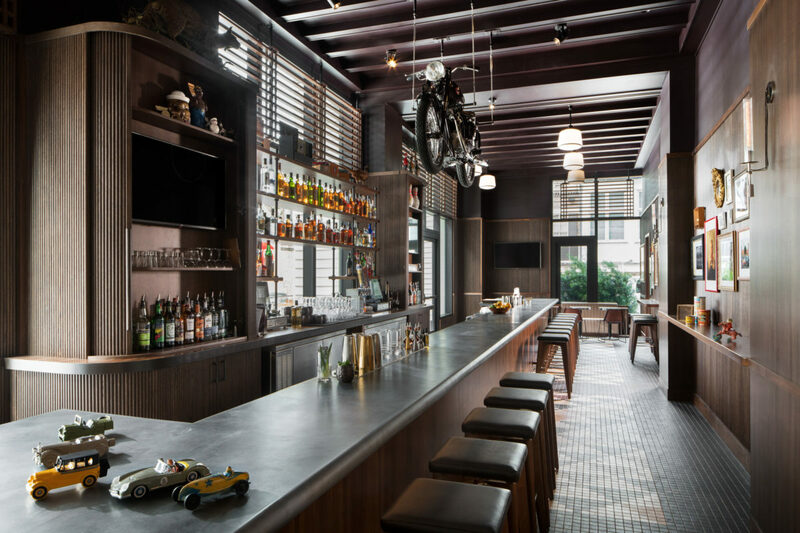 The Wayward, a racing-themed bar on the ground floor, specializes in craft cocktails.